For peak performance you need to know what your car is doing. Now you can track your vehicle attributes as you modify your car! All Electric Gauges perform a dramatic opening ceremony with a full pointer sweep and self check each time the vehicle is started. This Amber/White series gauge is designed so that you can display one color during the day and the other color at night. The PERRIN Boost Gauge measures your boost in Pounds per Square Inch (PSI). PERRIN gauges have micro-stepping motors with a built-in speed reduction ratio of 180:1 and accuracy as high as 0.083˚ at a maximum angular speed of 600˚/sec. It increases the dial resolution at 270˚ by at least 3,240 steps. The material selection and design orientation are primarily focused on anti-wear and low noise, which ensures the stepping motor of long-term operation in normal conditions. In order to increase the clarity of the gauge’s display under the bright light of daytime sun as well as making them eye-catching, mild, and less harsh to the eyes at night, the PERRIN gauge wiring can be synched with the car’s headlight switch. 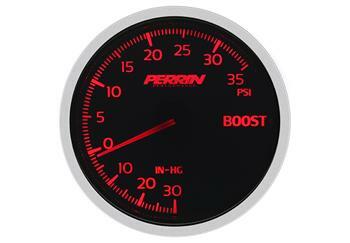 This dynamic feature allows the PERRIN gauge to feel like a much more complete part of a car’s interior. With the series function built into each gauge, installation of multiple gauges couldn’t be any easier or more time saving. Rather than running multiple power and ground cables to each gauge invidivually, simply run your daisy chain connector from one gauge to the next.